I know you can acquire items from a vehicle when your infantry is in a vehicle, but is there no way to do it without getting in? Additionally, it seems I cannot send a team to a vehicle, acquire some items/ammo, and then get out of the vehicle in all one command. I had to do it as follows: get into vehicle, end turn, acquire stuff, leave vehicle for building, end turn. Doing it that way just wasted a lot of time. I am a pretty new player so please pardon me if I am missing something obvious. No, you have not missed anything. You have to enter a vehicle to acquire ammo and gear. And it does take a few turns to make it all happen. There has been various discussions over the years of how to make a more robust inventory management system and perhaps one day we will get one. In the meantime while slow don't forget that in some ways it is faster because you can get just the right magazine or belt of ammo all ready to go, which in real life would take even longer depending on what your men needed. It can take some time to acquire ammo and equipment from a vehicle. One of the things that I found can help is the use of a two man scout team or AT team. I split a two man team (scout or AT) off from the squad. Now this two man team can be used to acquire ammo for the rest of the squad while the squad can remain on line fighting. Also the two man team is small enough it can get in most vehicles to acquire the needed ammo. After acquiring the ammo the two man team then returns to the same action spot as the rest of the squad. The game automatically recombines the teams into one squad and distributes the ammo among all the teams. Next turn you can split the squad back into fire teams. The teams / squad will distribute ammo and continue to shoot while recombining however there will be some danger while all the teams are bunched together. 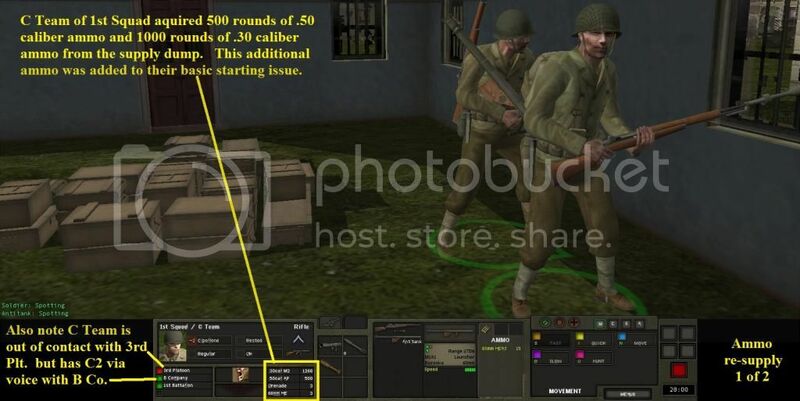 This method still takes the same amount of time but it keeps most of the squad in the fight and the two man team will almost always be able to get in the vehicle to acquire the needed ammo. Getting that two man team sent off in a timely manner to acquire the ammo is also important. Hope this helped and gave you some ideas. Oh man. I didn't even think about using a scout team or AT team. I just did a regular split. That would have solved my main problem right there! Thanks! You’re welcome. Also, as part of a pre-mission checklist, I usually have infantry squads with vehicles acquire the ammo and equipment during the set up phase before the mission begins. The squads can remain in the vehicles if desired, acquire what is needed, get transported to their drop off point and continue on the mission. Then, most of the time, I can avoid acquiring ammo while the bullets are flying. True, however I usually have them acquire only a modest amount of extra ammo/equipment that I know that they are going to need, since I notice in BS at least they seem to tire a lot more quickly if they are lugging around a Javelin and reloads plus a couple extra AT4s and 5,000 rounds of 5.56mm. It's really a balancing act. If all they need to move is from the IFV parked behind the building where they are going to have to play Last Stand at the Alamo, then by all means have them bring everything in. But if they are going to have to be moving a lot over longer distances, they should travel light. They also don't move nearly as fast. Aquire the Javelin, lose the ability to use "Fast". Aquire the whole load, and lose the ability to use "Quick". That is a good point and one of the things I like about CM. It provides tactical choices that you have to make. Light and agile or better armed but slower. When I was in the Army we had a saying, "Travel light, freeze at night" and we often did. I hope BF updates the WWII titles with this more accurate fatigue modeling. I don't think I have ever lost the ability to move my troops "Quick" in the WWII titles. But I probably should have. In the WW2 products, teams that start out heavily laden (like gun ammo bearers) can be unable to go faster than Move. But I haven't had a team that uses Acquire lose any movement modes, that I've noticed, even when the Acquire command wouldn't let me take any more bullets or bombs. Though I quite possibly haven't even tried to use Fast with such a team until they've expended some of that load. well crap, I was hoping there was some magic here although the 2 main team aspect is an improvement. I wish they would allow us to turn on automatic ammo resupply if vehicle is close and stationary and they aren't under fire for the higher grades of difficulty. Kinda tedious especially for the larger scenarios. As others have said, the acquire system is a bit fiddly and probably not ideal but these dramas add those little bits of tension to the mission and require you to make choices. Kinda tedious, that's logistics for you 😉, but as a famous dead chap said 'amateurs discuss tactics, professionals discuss logistics'. I usually acquire a full load of extra missiles for a javelin team and they can still easily move quick? Not sure about that, though the second launcher definitely would be an issue. This is part of why I miss the flexibility of LAWs - I wish we could choose between at4s and LAWs. My tip re: Acquire.....Do it before the enemy Hinds arrive! The Sarge's pixeltruppen have had a very bad night indeed. but even if you ascribe to the travel light idea youre doing yourself an incredible disservice for ANY battle in ANY cm if you dont see whats in your apcs and trucks. Examples : often theres an extra schreck and rounds or zook and rounds. You may as well add that to an infantry squad that doesnt have one or some hq if you want. The German STG44 rounds. Not a lot floating around and youd really better grab any extras whilst you can - especially if youre using a STURM bttn thats. Solely equipped with them. In more modern titles theres lotsa rp7hs floating around and almost always a few squads wont have organic AT. Why would you not? Also many times way better quality one shot rpgs (like the 29) are sitting there and honestly are better to stock up on for a AT team with RedFor than just an rpg7. Same with alot of reg inf in SF. They may have 1 LAW or 2. Why not load them with (all they can carry like me) or at least an extra LAW or two? Those things go fast in heavy infantry firefights and more than once Ive seen them decisively tip a firefight - just as Ive seen an RPG do the same against soldiers just fighting back with 5.56..